Do Genealogists Care About Family Artifacts? This is a guest post by Joy Shivar, owner of JustaJoy.com Family Heirloom Exchange, a surname-searchable, bulletin board-style website used by antique dealers and others to reach out to family members. With thousands of original items associated with more than 100,000 surnames, JustaJoy has become the largest in the world at matching antiques and artifacts back to families. Joy’s background as a lifetime antique collector and dealer makes her uniquely qualified for such a venture. She describes her website as “Antique Hunting in the Family Tree” and loves when matches are made. Do genealogists care about family artifacts? The quick answer is yes and no. 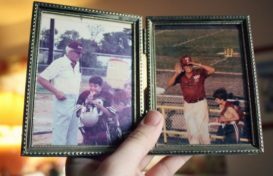 I have met people who would walk a hundred miles, if necessary, to have the chance to hold or own an item that belonged to a great-grandparent, while others would simply throw all of that “old stuff” away. There is a joke in the antique business that antique dealers buy “junk” but sell “fine antiques.” Perhaps, it is all perception but I think it goes a little deeper than that. After many years of studying how old things touch some people, I have come up with a theory I call “DNA Memory.” In the antique world, different customers often seem to be instantly attracted to a wide variety of items. One lady sees the beauty in a handmade quilt while another is drawn to books, vintage clothes or old tools. I have seen men touch the stock of a colonial period musket with such reverence that it was easy to see they “felt” something from the gun. DNA Memory would explain why some people are drawn to one class of antiques, art, and silver, for instance, while others are drawn to primitives. I have even come to believe that if people did not feel something from old things, there simply would not be an antique industry. But an industry it is. In nearly every town and city, one can find antique stores, malls, and events. Each one seems to hold items that others don’t have and different dealers have different specialties. Everything from antique newspapers to world’s fair souvenirs can be found and many of these items are identified. Family relics get away from families in many ways. Widows or widowers of second or third marriages may not have the necessary knowledge to place items correctly. Bankruptcies and divorces can also cause precious artifacts to become “orphaned heirlooms”. But the biggest culprits we have found are administrators of estates. Often overwhelmed with a massive collection to distribute and burdened with the accompanying court-ordered paperwork, an executor will often lose sight of the big (generational) picture. They can’t be concerned with little things like photo albums or family Bibles when they have a $250,000 estate to dissolve! As a result, nearly every antique dealer ends up with family-related items. Often the date and associated place can also be determined. These items take many forms. Letters, regimental photos, dog tags, friendship quilts, art, signed handmade furniture and clocks, engraved silver and gold, advertising pieces of all kinds, marriage licenses, baby pictures, yearbooks, personalized shaving mugs, trophies, wanted posters and court documents, needlework, and much, much more can be found. We sometimes hear, “But, I already have everything from my family,” to which we answer, that is not possible. We have found that genealogists regularly underestimate the massive assortment of items available. Because most family-related artifacts have real value, they are rarely destroyed, just passed from collector to collector. And we can also say on good authority, as these items are restored back to loving families, it brings a kind of happiness that little else can do – not just for the families but also for the person who made the restoration possible. Take the story of two JustaJoy members, for instance, Bruce Weekley (Columbus, North Carolina) and Luella Taylor (Denton, Texas). Bruce, an antique dealer who specializes in historical paper, pictures and postcards, joined JustaJoy as quickly as he heard about it in 2012, and began posting fantastic material that included items that predated America’s Civil War. One item Bruce posted was an 1856 business ledger from a general merchandise store in Shelby, NC. The business ledger that Bruce purchased. He purchased the ledger at an antique auction near Shelby and posted it on JustaJoy, listing all the names he could find. The store had been built and owned by Charles C. Durham, Luella’s great-great-great-grandfather. There are many more such events on the website’s “Happy Stories” page. The opportunity to discover family artifacts is the reward for all those years of research and can make genealogy tangible to the delight of many generations to come, as well. This is treasure hunting at its very best! Thank you for the opportunity to write about “Antique Hunting in the Family Tree”. It was a delight to work with you!. I have been mesmerized since I was a child…by ‘stained’ glass. Wonder if that tells anything about my 9+ ethnicities. they do not have. Good hunting. And then you have those of us who do want things but the spouse deprives us of them. My cousins wanted their grandmother’s china which was passed to their aunt (my mom’s cousin). I wanted certain pieces of jewelry that I had designed for her (once the design was done she would come pick me up & we would go down to Tijuana to a silversmith she knew & have a “girl’s day out”). But her husband locked us out and sold everything! I CARE. I find it sad that so many items have been tossed or given to someone who is not a descendant. I did get a broach from my grandmothers things that has a picture of her sister who died as a child, but that isn’t much. When I dad was ill, I wanted till he died to approach my step mother to ask if I could have some of his things. Her daughter from another marriage had already thrown everything of his out, before he died. I was heart broken. .
home shows and without a second thought family heirlooms get thrown out just to achieve the contemporary look. Family heirlooms do matter. the only difficulty is how to create a space to store and keep them without having to hide them behind locked doors. Many years ago at my Grandmother’s sale of household goods, there was a set of Large serving plate and several small plates — with PHEASANTS on them. After the sale my dad (now deceased) said he would have liked that set. Too bad he hadn’t told any of us. Anyway just wondering if anyone knows who bought this set and are they willing to give it back to our family.